Who says you need skill to survive the apocalypse? You are an intelligent person. Right now, somewhere in your house, you have a packed 'bug-out bag' filled with supplies and weapons, just in case the zombie apocalypse should hit and you have to make a dash for survival. Obviously, that all goes without saying. Question: what is your primary weapon in the bag? If you've got nothing but a blunt bread knife and a child's cricket bat, you need the Pioneer Airbow. This $849 rifle-shaped air-powered crossbow can shoot full-sized arrows at 450 feet per second, and uses 3000 psi of compressed air to do so. If after watching The Walking Dead you decided that a crossbow would be the perfect zombie weapon of choice, think again. 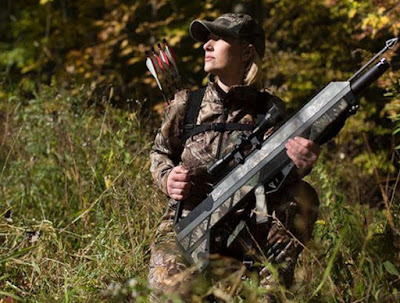 The Pioneer Airbow can shoot eight arrows in the same time it takes a conventional crossbow to shoot three, and the weapon can be recharged with a hand pump - no yanking back a tough bowstring. 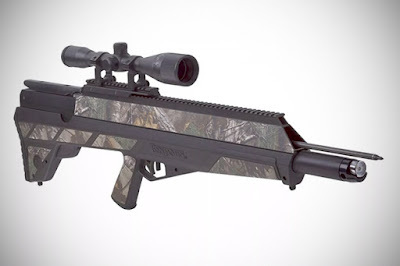 Plus, the Airbow features a sight, is smaller and more compact than a crossbow, and as you can retrieve your arrows from the punctured skulls of fallen zombies, you'll never run out of ammo. Best of luck. We'll meet you at the chopper.